Attempts to control land use in Michigan date to 1921, when the Legislature first authorized zoning by cities and villages. Township authority for zoning was added in 1929, and county authority in 1931. Planning authority for cities, villages and townships was enacted in 1931, followed by regional and county authority in 1945. But the 1960s and 1970s proved to be the heyday of land-use regulation, a period when 25 state laws regulating development were enacted. Various governors have attempted statewide planning with little success. The first State Planning Commission was created in 1933, but disbanded in 1945. Gov. William Milliken, a co-chair of Gov. Granholm’s land-use council, appointed a special commission on land use in 1975, but its charge to develop a state land-use plan went unfulfilled. His successor, Gov. James Blanchard, issued an executive order in 1986 requiring state agencies to assess the effect on farmland of administrative actions. A commission appointed by Gov. John Engler identified the lack of coordinated land use planning as the state’s highest environmental risk. For all of Lansing’s efforts to centralize land-use control, local units of government are understandably reluctant to cede their zoning and planning powers. And rightfully so. A diversity of policies provides citizens with a wider variety of options than does any centralized system, such as that being proposed by Gov. Granholm’s land-use council. The state’s Subdivision control Act of 1967 has exerted significant influence on development patterns. The Act dictates platting requirements to ensure that land is suitable for building, including requirements for adequate drainage; proper ingress and egress to lots and parcels; proper surveying and accurate legal descriptions; and easements for utilities. The statute largely exempts from the platting requirements parcels created by a land division of 10 acres or less. Critics contend this exemption fuels land consumption. But the Legislature has resisted demands to rewrite the Act. More direct government attempts to preserve farmland and open space debuted in the 1970s, and have been expanded in recent years. The major initiatives are outlined below. Public Act 116 was designed to slow the conversion of farmland by offering tax credits to farmers in return for a 10-year restrictive covenant not to develop their property. The credit is applied to the amount of property tax that exceeds 3.5 percent of household income. Alternatively, property owners may receive a credit toward the Single Business Tax equal to the amount by which the property tax exceeds 3.5 percent of adjusted business income. Enrollees in the program are also exempt from special assessments. The restrictive covenant may be renewed in seven-year increments. Failure to renew the covenant requires repayment of all tax credits received, but no penalty is assessed. The Act also authorizes the Department of Agriculture to purchase permanent conservation easements using the tax receipts recaptured from the repayment of tax credits in cases of nonrenewals. Some 60,000 covenants have been negotiated prohibiting development on 4.3 million acres of agricultural land, which constitutes 45 percent of farmland statewide. A total of $30 million in recaptured credits has been collected, with which the state has purchased 50 permanent conservation easements encompassing 12,000 acres. 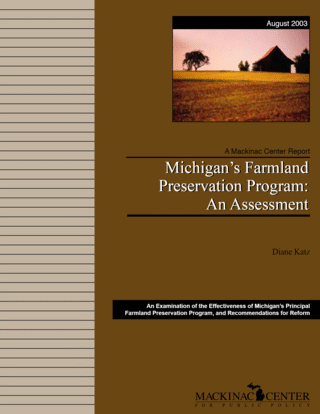 The Legislature in 2000 created the Agricultural Preservation Fund to provide matching grants to local governments for the purchase of development rights. The program is funded from the repayment of tax credits by farmers who terminate their conservation covenants with the state. TDR programs allow developers to exceed local housing density restrictions on one site by retiring development rights on a second site. A TDR treats development as a fungible commodity. Under this program, eligible agricultural processing facilities are granted tax breaks for establishing facilities within designated zones. Nine such zones have been established statewide. Jointly funded by the state and federal governments, the CREP program provides cost-sharing grants to farmers who institute conservation practices. The program is limited to cropland and pasture. This program reduces the tax burden on forestland. Commercial forests enrolled in the reserve program are only taxed $1.10 per acre; private forests are taxed at $1 per acre, plus a stumpage fee equal to 5 percent of the value of timber cut. In an attempt to augment state preservation efforts, Congress in 1976 authorized the tax deductibility of conservation easement donations. Eligibility is restricted to permanent easements that provide recreational or education access, or a “scenic” amenity to the public. The Taxpayer Relief Act of 1997 also allows a deduction from the estate tax equal to the value of a qualified conservation easement that has been granted by the decedent or a family member.